1285Dragonfly - 1lt Floor Lamp, Antique Brass, Tif.. Looking for something bigger than a Desk lamp? Prefect! cause our floor lamp range are all 20 inches in width. Floor lamps are longer in height than desk lamps by more than double, this is so they can be placed anywhere there is space in a room without a table needed.Would you like to know a little bit more about our Tiffany lights? 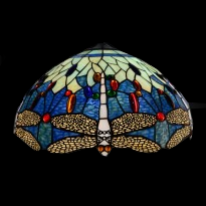 All our tiffany lamps shades are hand made from glass and copper foil in the age old traditional method of manufacture. The only modernisation is the use of lead free solder to ensure full compliance with EU import regulations.Our lamp shades are sold separately so you can mix and match the lamp base, flush fitting or pendent.